Ask anyone to name you a famous magician, and they are very likely to come up with Houdini, even though he wasn't a great magician and didn't have the stage presence and charisma of other performers of his time. In fact, he wasn't even a magician, he was an escape artist. He created a new genre and that was made him famous. In this light, we can considerd him a pioneer of the Blue Ocean Strategy popularized by Cirque du Soleil where, instead of competing in a saturated market (red ocean), you create new markets (blue ocean). If this kind of outside the box thinking lights your fire, I strongly recommend you to read The Big Moo, by marketing guru Seth Godin and friends. It is a sort of sequel to his bestseller book Purple Cow and it is very inspiring. 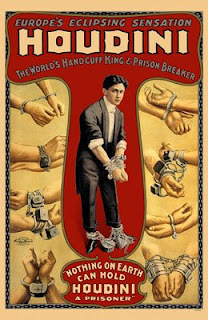 You'll learn more about the Houdini story and other fascinating ideas. Publié par Unknown à l'adresse 5:12 p.m.